It seems about once a year, a new Superfood hits the market. Before superfood's became a trend, I have always been one to lean towards foods which can help naturally with various health needs. Dr. Oz recently blogged about a new Superfood called Camu Camu Amacari, calling it the "missing fountain of youth". 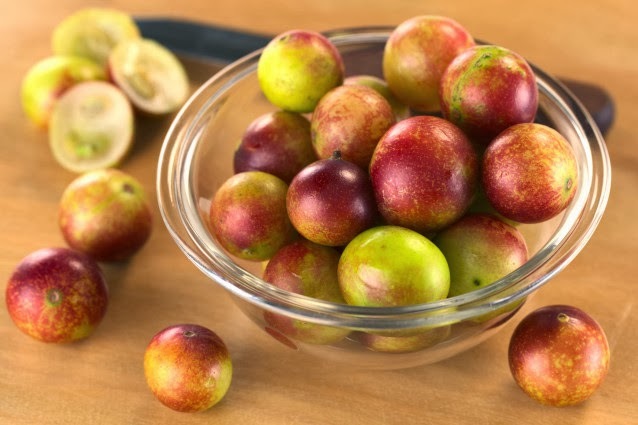 Camu Camu helps with energy, focus, Vitamin C, Anti-Inflammatory, Antioxidant and Anti-aging. What is Camu Camu? Besides being the most vitamin rich C berry on earth, it is also full of amino acids, betulinic acid, phosphorus, beta-carotene, ellagic acid, B vitamins and impressive levels of phytonutrients. It has been used for everything from pain reduction to looking younger. Since the Camu Camu berry is highly acidic and tart, it is mostly consumed in jams, ice cream and through powdered supplements. What makes Amacari different? It is made with 100% wildcrafted and sustainably harvested camu camu, with no fillers, additives or artificial ingredients added. I would love to try Camu Camu because of the health benefits. I don't take a multi vitamin or anything. I need to get on it. I've heard it provides great immune system support which is great and I also have painful fibromyalgia and would love some relief from the daily pain and inflammation.